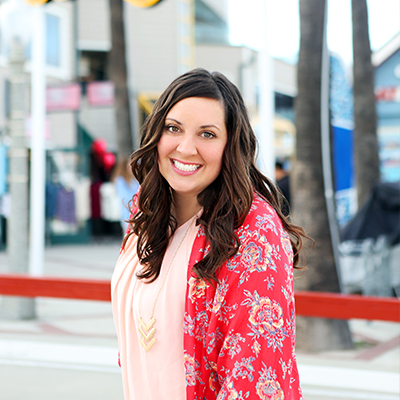 Jill Parkin is an Orange County native and the writer and creative mind behind the Southern California lifestyle blog, Sandy Toes and Popsicle Blog This is where she shares the best things to do in Orange County, recipes, crafts and travel tips for families. Jill is the mom constantly on the go with her family; enjoying the outdoors, road tripping and exploring new places. 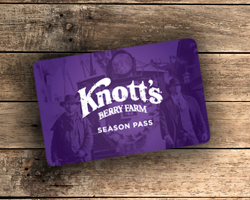 She’s very grateful to be able to share her love for Knott’s on the Berry Blog. 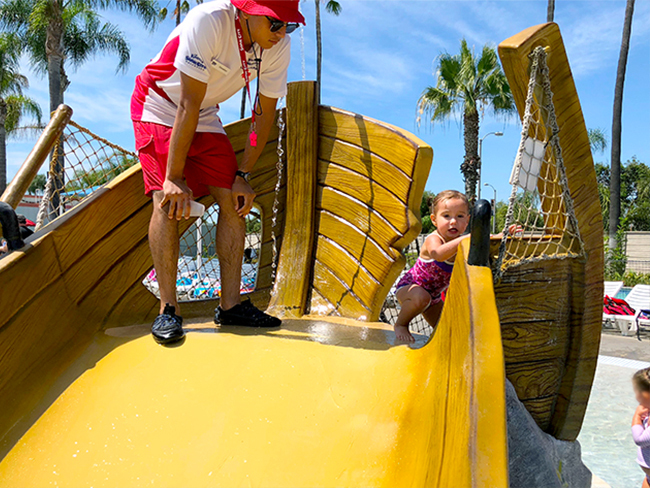 You may be wondering if it’s okay or fun to bring a toddler to Knott's Soak City. 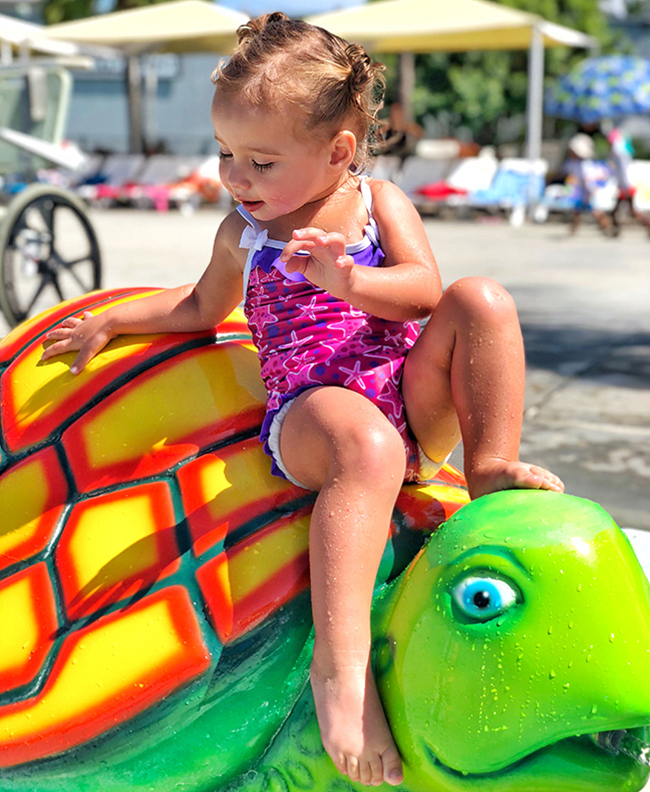 The answer to that is...OF COURSE – there are plenty of things for a toddler to do at Soak City! 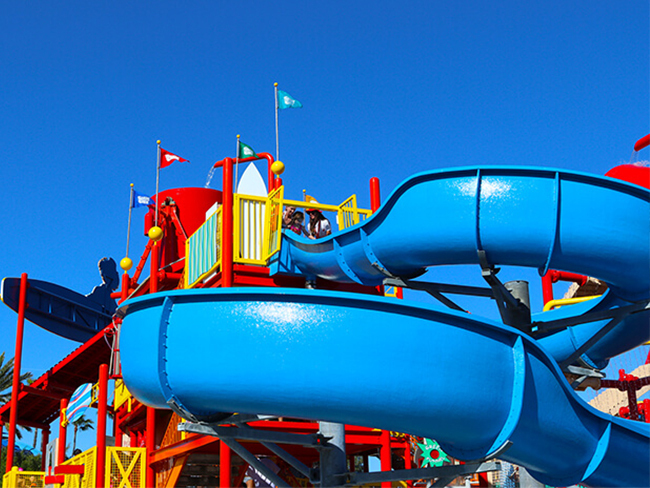 Don't let a toddler discourage you or your family from coming to the water park. It is so much fun for all ages. 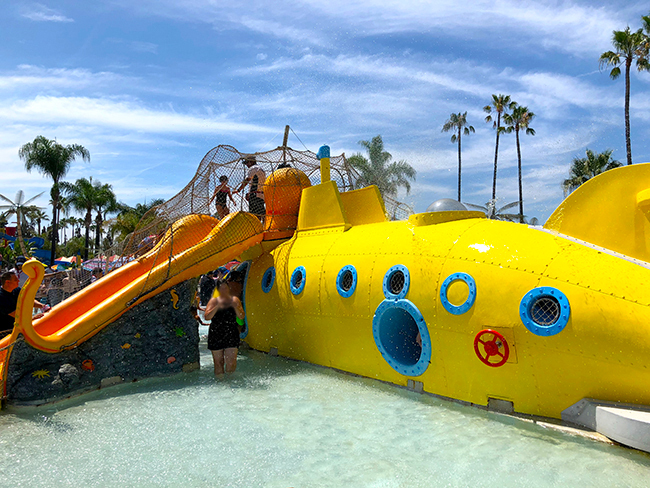 In this post, I will share with you how to navigate Soak City with a toddler, what things you can do to stay entertained, and some tips and tricks to make your visit enjoyable. 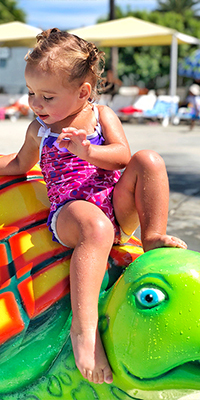 When you bring a toddler to Knott's Soak City, you will want to bring a swimsuit, a swim diaper if they aren't potty trained, a towel, and sunscreen. You also want to make sure that they are wearing water shoes or waterproof shoes, as the ground gets very hot on sunny days. You can also bring your toddler some snacks if they have a special diet or food preferences, but make sure they are in a small ziplock bag or small plastic container. No full sized food packages are allowed in the water park. Only small hand-held coolers not exceeding 12"x18" in size will be allowed – containing water bottles and sports drinks only. Soak City has toddler-friendly food such as chicken fingers, pizza, and fruit available for purchase. 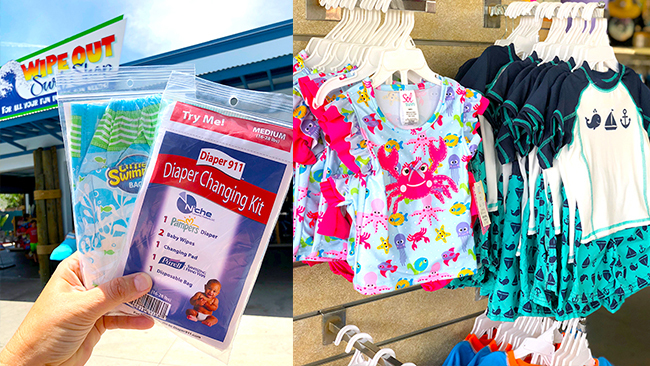 If you happen to forget your toddler’s swimsuit or need an extra diaper or baby items, you can find some of the essentials at the Wipeout Surf Shop inside the park. 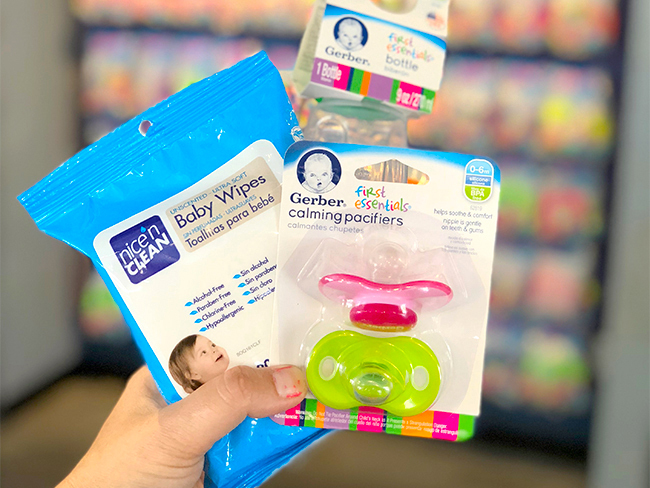 They even have pacifiers, wipes, and bottles if you need them in an emergency. I can not tell you how grateful I was to be able to buy a pacifier when my toddler’s pacifier got lost. After a long day of water fun, it would have been a disaster if we didn’t have one. 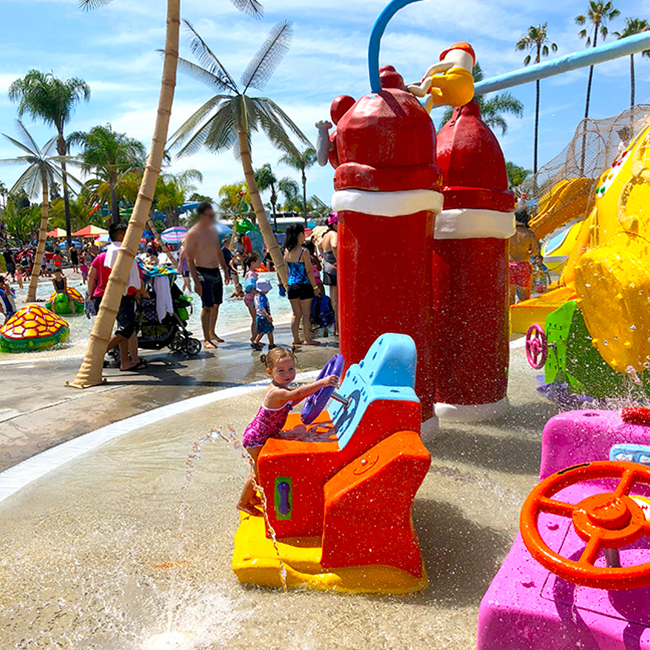 There are a few different areas that are fun for toddlers to play in at Knott's Soak City. The main area for small kids is called the Gemmie Lagoon. It has water features, small water slides and shallow water that is less than knee high. Of course, there are plenty of lifeguards watching the area, but you still want to keep an eye on your children as there are lots of areas in the Gremmie Lagoon to explore. 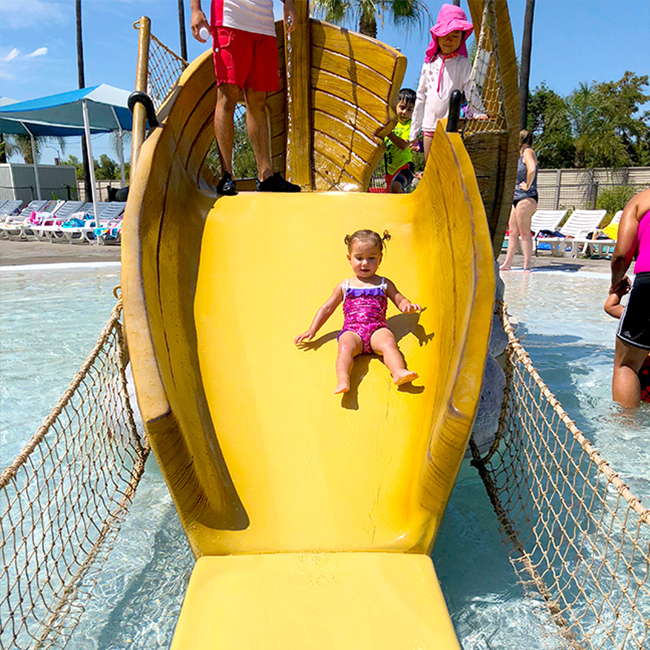 My little one loves to go on the little water slides that aren't too fast or big. 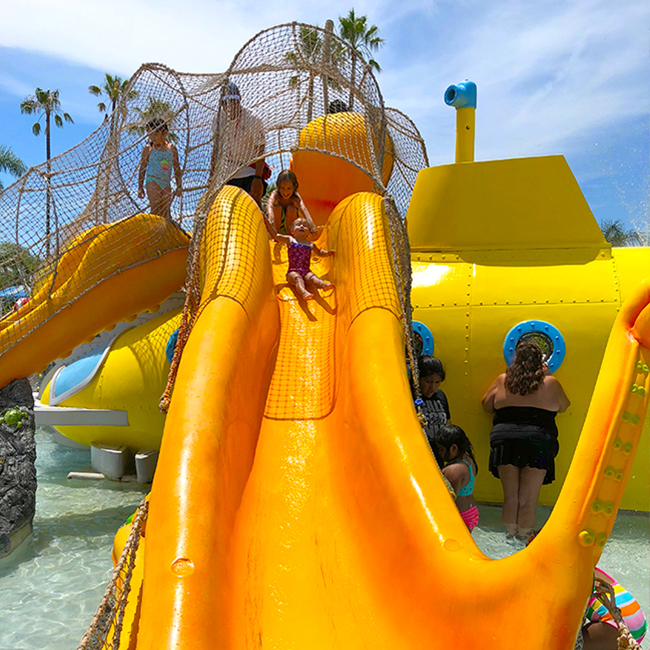 Parents can't go up with the kids, but they can wait at the bottom of the slides to catch them. Wheeee! This spray area and the submarine with a slide are also a lot of fun. The best part about the Gremmie Lagoon is that there is plenty of seating around it for the parents to set up their things for the day. There are also plenty of different water features to keep a toddler occupied for hours. Other areas in Soak City that you can take a toddler in are the Lazy River and Wave Pool. 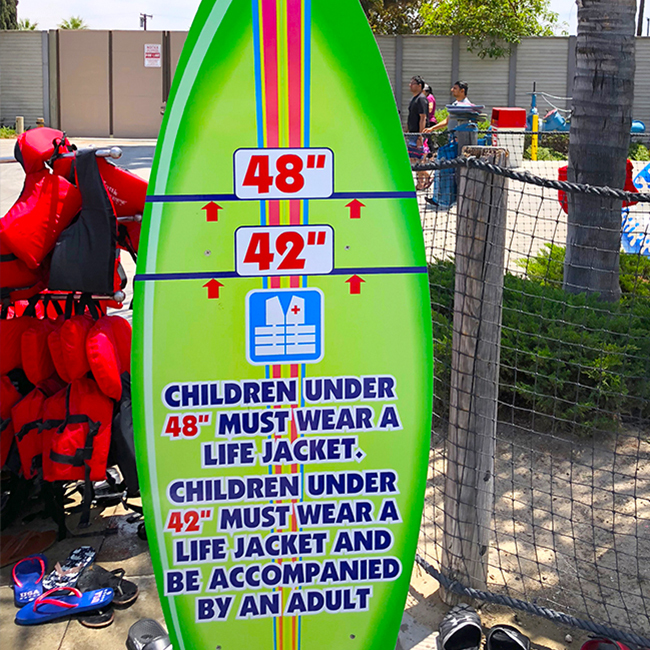 Kids under 48" must wear life jackets in both of these. 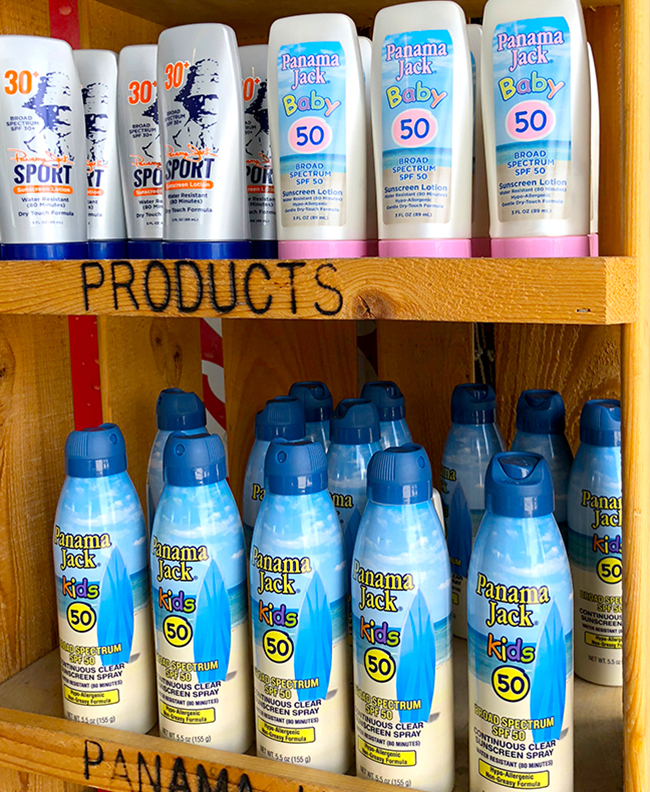 Luckily, Soak City has plenty of baby and toddler sized life jackets for you to use or no extra cost. Many toddlers love to sit with an adult in an inner tube and float around the lazy river. After two times around, my little one was so relaxed. She almost fell asleep! 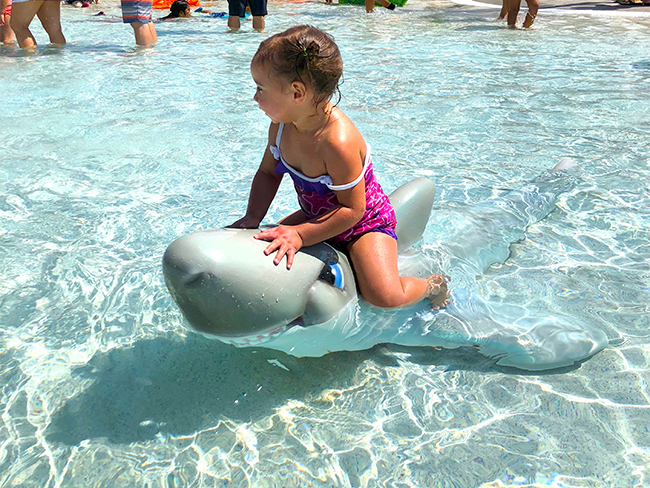 In the wave pool, it's fun for the little ones to walk along the outside and jump in the small waves as they roll in. They can also sit down in the shallow water and cool off! Finally, if your toddler is a little more daring or you want to join them, head over to the Beach House. There are water cannons, water features, small water slides (must be 42") and a big bucket that dumps water every ten minutes or so. My little one enjoyed walking around the splash area but was too small for the water slides. 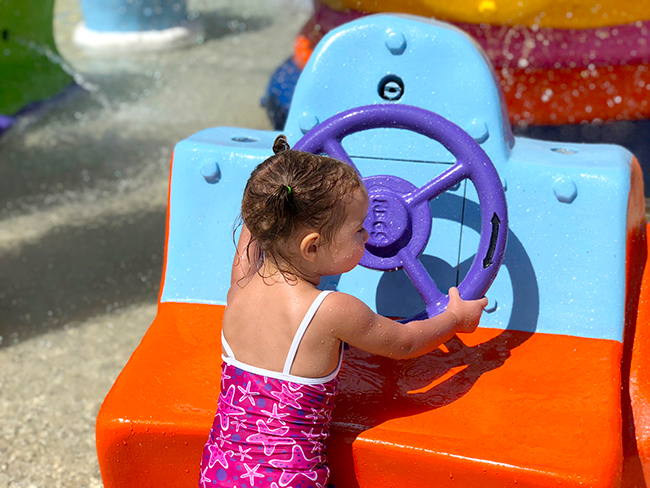 Now that I have shared what attractions toddlers can enjoy at Knott's Soak City, here are some of my favorite tips for bringing a toddler to Soak City. You most likely want to make your day easier bringing a toddler and all. Toddlers can be fussy, like to run away, and get cranky when they get tired. 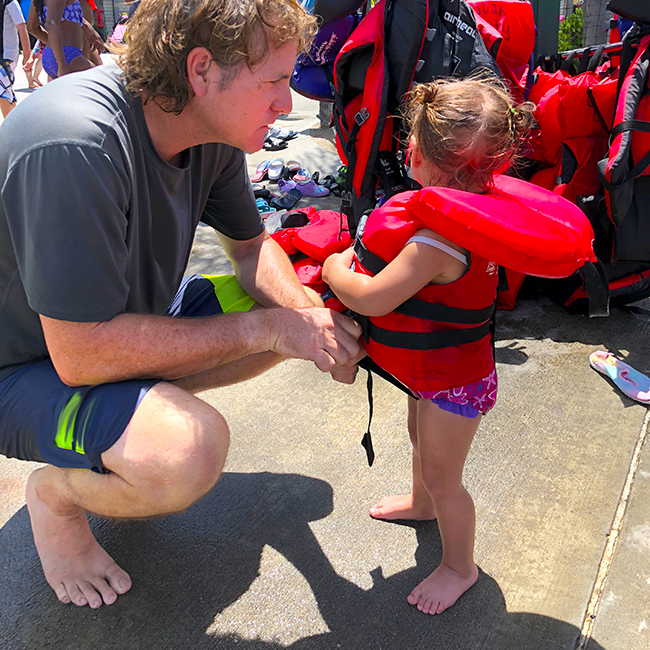 Here are my favorite tips that make life with a toddler at a water park easier. Bring a wagon. This way you can put everything you brought, including the toddler, and easily pull it into Soak City. Rent a cabana or bring an umbrella. 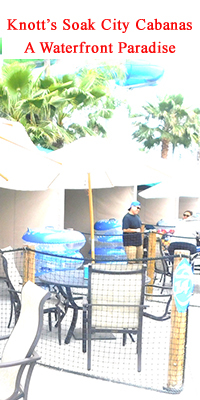 You may not get a seat with shade at Soak City, so renting a cabana has been such a lifesaver. It's the perfect gathering location for a family. And toddlers can take a little nap on the lounge chairs inside. You can also bring an umbrella measuring no more than 8 feet in diameter. There is a grassy area near the Gremmie Lagoon where you can lay out your towels and set up an umbrella for shade. 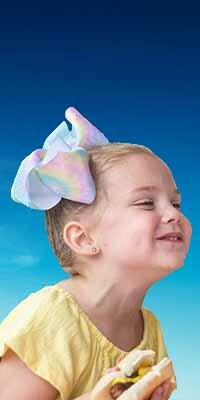 Have your toddler wear a bright, solid color swimsuit or rash guard. The best thing I have ever bought was a fluorescent orange rash guard for my toddler to wear at the water park. You can spot them in an instant among a pool area full of kids. Arrive Early. 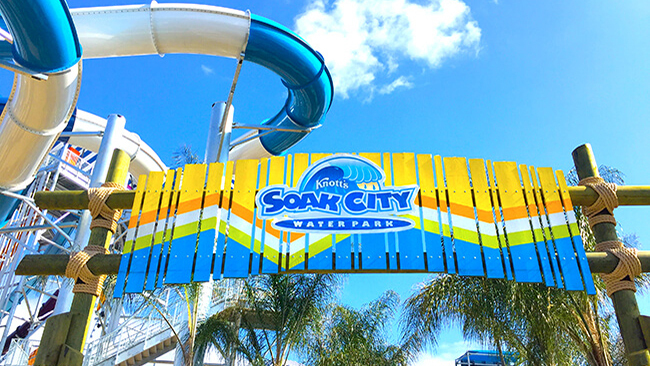 I can not stress enough how much more enjoyable your day will be if you come to Soak City as early as possible. This way you can choose out better seats, enjoy the water areas before they get crowded and your toddler is refreshed from a full nights rest. We love to come early and leave in the afternoon at nap time. 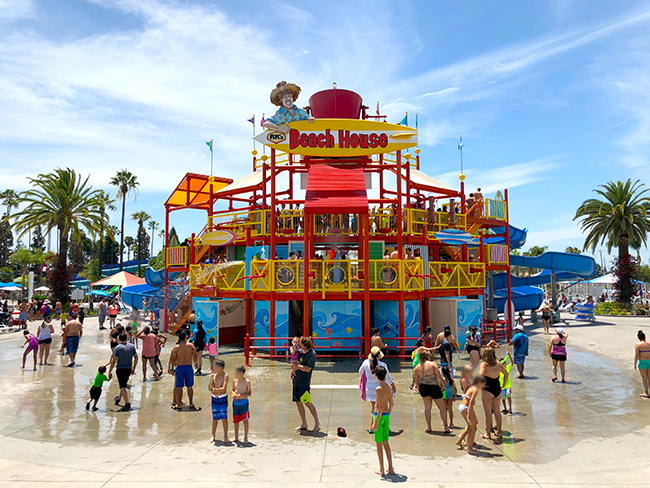 Knott's Soak City is such a fun place for families with kids, and you don't have to miss out just because you have small children. 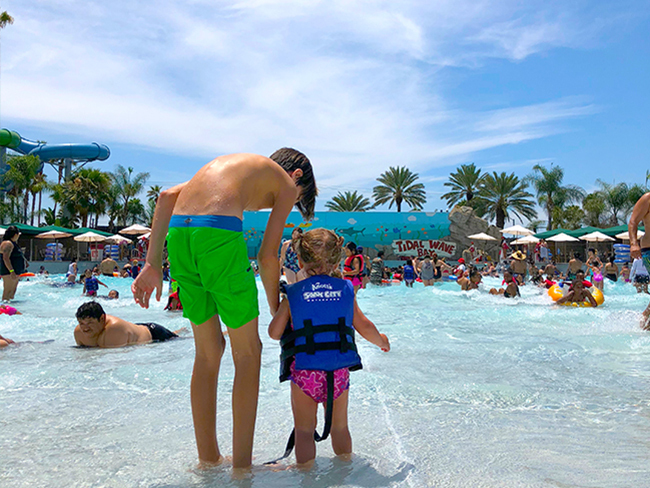 They may not be tall enough or old enough to go on the big waterslides, but there are still plenty of attractions for them to enjoy. 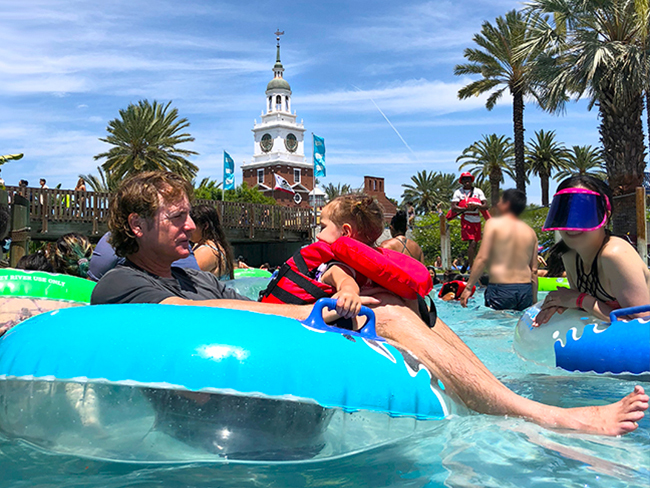 I hope you can visit Soak City this summer...our family has made some of our best memories at Knott's! 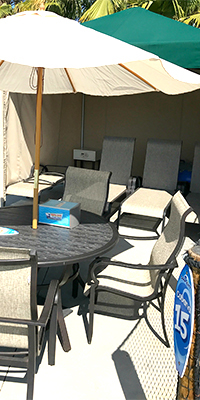 Top 3 Reasons to Rent a Cabana at Knott's Soak City Waterpark! Do you crave the nightmare? 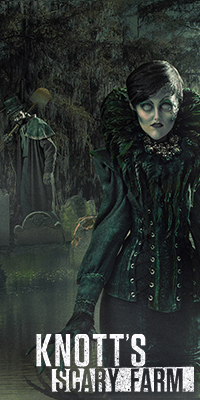 Join Berry Blogger David as he discusses the nine reasons he craves Knott's Scary Farm all year round. Check out our best tips and tricks to help you brave whatever lies within the fog and maximize your nightmares. 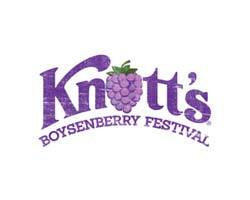 Enjoy Labor Day Weekend at Knott's Berry Farm with an end of summer celebration! We're lighting up the night sky with a firework show, tappin' our toes at the Ghost Town Alive! season finale hoedown and offering special $1 deals on select food, souvenirs, and games this weekend. Traveling with little ones isn't always easy! 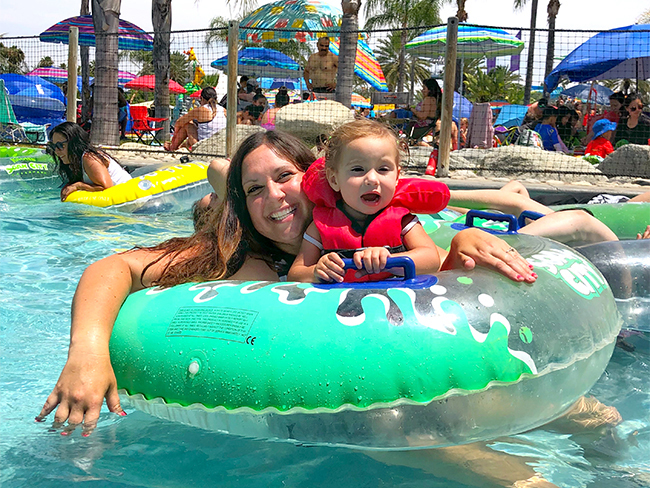 Join Berry Blogger Jill as she gives tips and tricks of experiencing Knott's Soak City Waterpark with a toddler. When you're looking for a break from the rides and excitement of Ghost Town Alive!, a live show at Knott’s is the perfect option. 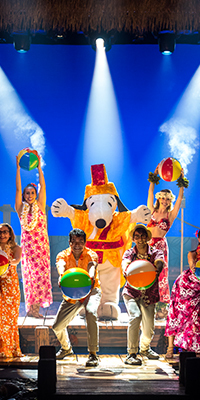 There are 9 ​​​​​​​action-packed shows with talented performers, catchy music, fun costumes and breathtaking dancers. Berry Blogger Melodi, is here to guide you through it all. 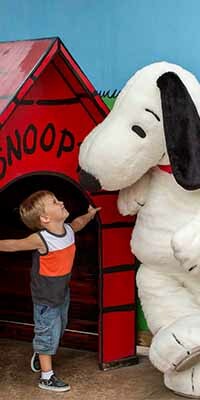 Wondering if your ASD (autism spectrum disorder) child can visit and enjoy Knott's Berry Farm? Spending a day at any theme park can be challenging with autism. 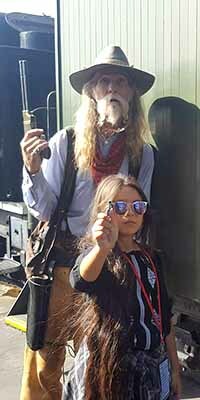 Guest blogger and mother, Catheryn, is here to give you her take on enjoying Knott's Berry Farm through ASD challenges. 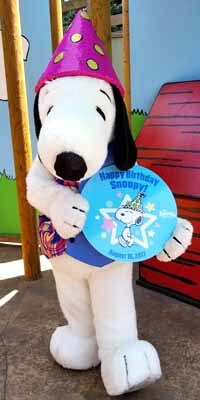 Join Knott’s Berry Farm on August 10th in wishing Snoopy a Happy Birthday with these beagle- tastic celebration ideas! 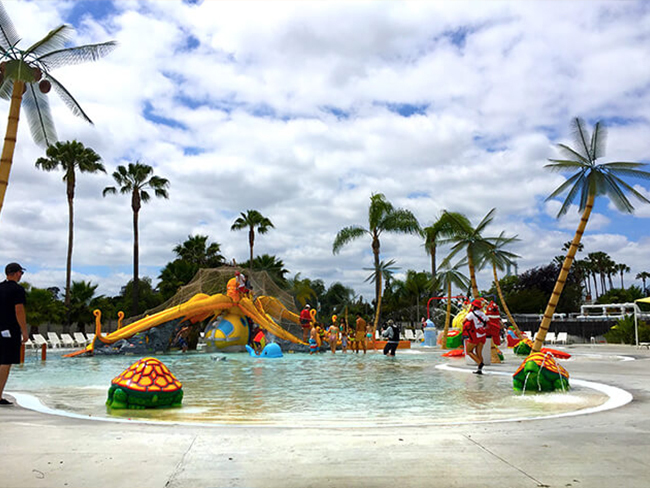 As Orange County’s largest waterpark, there is something to do for everyone. 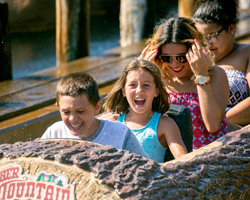 Whether you have an infant or a teen, make a splash at Knott's Soak City this summer. 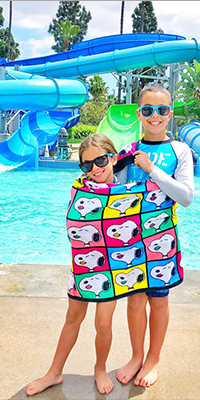 Check out this family guide to Knott's Soak City Waterpark with Berry Blogger, Caryn. Ghost Town Alive! is the interactive entertainment experience where you get to choose your adventure and become a citizen of Calico. 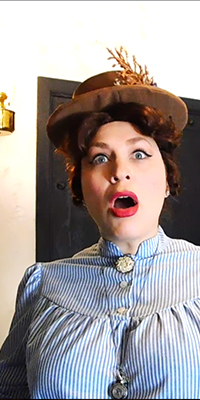 Join Berry Blogger David as he goes undercover as Calico's newest reporter, DeAngelo Mayfield, to find about the gold rush that's sweeping Calico in this season of Ghost Town Alive! In partnership with the Autism Society of America, July 16 - 22 is Autism Awareness Week at Knott's Berry Farm. 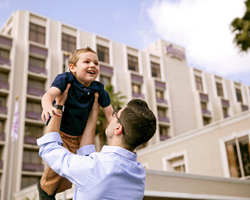 Check out these helpful tips to make the most of your family visit.